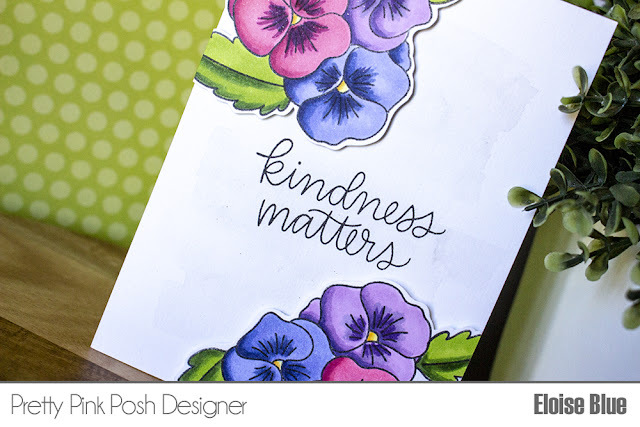 Hi everyone, today I'm here to share with you my creation using the brand new set for STAMPtember from Pretty Pink Posh. It's called Pansies and it's super amazing. It compliments the rest of the flowers line Paulina has going and I really love this one. You can purchase this stamp set here if you would like too! 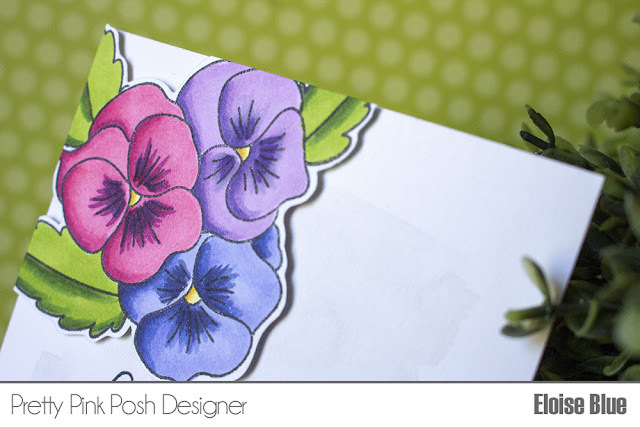 To begin my card today I started off with stamping the cluster of Pansies off the edge of a piece of white cardstock twice on different corners. I then used a few masks to stamp some leaves as well. I then cut them out using some scissors and then coloured each piece in with Copic Markers. Once they were both coloured in I set them off to the side to work on the background. I pulled in my Misson Gold Watercolours and did a few quick swipes of a light grey colour in the centre of a watercolour paper panel. I then dried it off with a heat tool and adhered my images into each corner. Lastly, I stamped the 'Kindness Matters' sentiment from Simple Sayings: Kind into the centre and my card was complete. Thanks so much for stopping by today, I hope you enjoyed and you're loving the new PPP STAMPtember set as much as I am.